Thank You! Kiitos! Merci! Danke! Grazie!Gracias! Tack! In many ways we would like to 'Thank You' for doing business locally with us! We appreciate being you GO TO place for electronics and cellphone products. 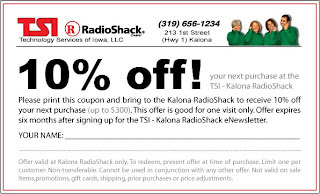 Just print this coupon and bring it in on your next visit to TSI RadioShack.